Sorry this one took so long, job stuff. Background: This is the only book by Miller published during his lifetime, and it’s a doozy. 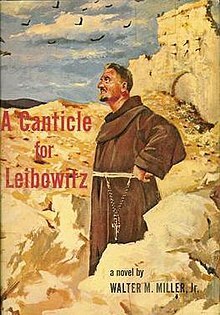 He published a number of short stories as well, and a sequel/ midquel to A Canticle for Leibowitz was published after his death, nearly 40 years later. Synopsis: Several centuries after civilization has been brought down by nuclear war, a monastery does its best to preserve the remnants of civilization. The book charts the return of civilization through the centuries, eventually culminating in nuclear war anew. Verdict: Yes, yes, absolutely yes this book deserves the Hugo. None of the other competitors this year even approach A Canticle For Leibowitz. Deathworld is fun, but Harrison didn’t stand a chance here. The High Crusade probably could have pulled it off it had just been published a year later. Remember when I was talking about A Case of Conscience a few awards back? That was okay, but this right here is probably the best representation of religion in science fiction I’ve ever encountered. Seriously, if you haven’t read this book, go read it. Right now. Now now now now now. Hmm. Without stuff to complain about, this one’s going to be pretty short. Oh, wait, I can complain that I didn’t get nearly enough of Walter M. Miller Jr.’s writing. Trivia: This book was inspired by Miller’s participation in a WWII bombing run that destroyed the monastery at Monte Cassino. ← Hey! A friend of mine is nominated for an award!